And he hearts me right back YAY! Is there any man, let alone leader of a free country, more adorable than Justin Trudeau? He has it all and he's a proud feminist. He needs to be cloned. 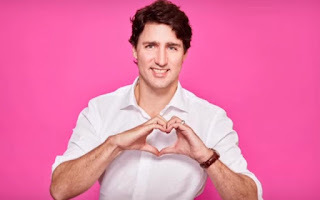 Trudeau identifies as a feminist, having stated, "I am a feminist. I'm proud to be a feminist." Trudeau has also stated that "the Liberal Party is unequivocal in its defence of women's rights. We are the party of the Charter." After being sworn in as Prime Minister, when asked by a reporter why he felt gender parity was important when naming his cabinet, he replied simply, "Because it's 2015." More recently, he has similarly answered to feminist organizations on social media that "On behalf of the Government of Canada, I am writing back to let you know that I wholeheartedly agree: Poverty is Sexist".